This article may be of interest to those who are looking to do a re-styling of a rubber bumpered car. It covers only the styling changes to an '80 B that also underwent a 2" lowering using dropped spindles and chrome B springs, lowered rear springs, new bushings all 'round, a 7/8" front sway bar and 195/60/14 tires. These were a contributing factor to the resulting look and feel of the car. My goal in doing this styling change was to come away with a decidedly '60s, "factory works" look, and to get there without any welding, cutting, or body filler. It has the added advantages of requiring much less time & money than the typical conversion kit consumes, and the results are almost completely reversible should a return to originality be desired. This article will not get you a true "chrome bumper conversion" if one of the original grilles is a must. All of the stock pre-'74 grilles require the removal of the rubber bumper mounts. The final result will not be to everyone's taste, and in the end I did have to drill a hole under each taillight to attach a bracket to hold the homemade filler pieces. They were originally held by a double sided tape intended for automotive trim, but the extra weight and leverage opened up a gap over the winter, and thus the conversion became less than 100% reversible. Most of this conversion was accomplished using materials typically found underfoot (at least in my garage!). Various 3/8" and 5/16" bolts, nuts washers. The steel bar & tubing, stainless 1x6 (mm) mesh, fibreglass resin and cloth, and perforated steel were already in possession, but could be purchased for Cdn$50-60 if needed.You could get closer to the factory look. The yellow grille frame and valance can obviously be replaced by chrome and black, the bumper's over-riders could be installed, etc. One would still be stuck with the grille mesh pushed forward to clear the rubber bumper mounts as well as the homemade turn signal mounts & tail-light filler pieces unless the no welding/cutting/body filler rules were relaxed. Please note that the photos were taken on a rainy spring day after driving on some fairly muddy roads. No attempt was made at glamour shots by this very amateur photographer. The head-on shot below shows the final result of the front. The next photo below shows the mounting of the front bumper. The Crash Bar is 1" x 1/8" square tubing, cut to match the width of the car's rubber bumper mounts. It stands off from the mounts with a 3/4" long spacer cut from the same tube. 3/16" x 1.25" bar stock is bent to match the curve of the bumper and bolts through the crash bar and through the two holes in the chrome bumper. A 3/8" x 3" bolt goes through the existing hole in the rubber bumper mount to hold it all together. The chrome bumper ends are held to the valance / body with a fabricated 3/4" x 1/10" bent piece of bar stock, much like the original. I have no idea how much extra protection the crash bar yields, but it sure feels sturdier than the rather flimsy chrome bumper itself. I would have liked to put an arch into it to increase its body clearance and strength, but had no way to heat it sufficiently to give it a fair curve. A much lighter version is used on the back bumper. It was arched easily by supporting the ends and jumping on it, so probably has negligible crash protection.Staying at the front of the car, the next photo shows one of the fabricated turn signal lamp bezels that covers the valance and fender holes where the pre- and post- '74 turn signals were mounted. These are made from polyester resin and insulation foam. I started by taping the area, bridging the holes, with 3" clear packing tape. The next step was laying a heavy mat/woven combination, well soaked in resin, over the taped area to get a rear contour that would fit closely to the body contours. It is a good idea to let these pieces cure a bit before applying them to the vertical body surface. Otherwise, they will tend to slide around, and you will have resin dripping everywhere. When cured, they were trimmed to give the final body-side shape. At the same time, a piece of the same cloth was laid on a flat surface to cure. This piece would yield the two front surfaces that mate to the lens.The front shape was traced from the post '74 turn signal lens, and cut using a jig saw, while the backside pieces were pulled off the body and trimmed using the eyeball technique. Insulation foam was sprayed onto the backside plates and allowed to cure. After curing, the foam was trimmed flat using a utility knife and front lens plate was glued down using wet resin. After curing, the foam sides were trimmed to merge the front and back shapes, and the exposed foam was painted with PE resin. A couple coats of surface putty, and some sanding and spraying with Tremclad Green finished them off. Tremclad Green (Rustoleum in the USA) comes surprisingly close to Brooklands Green in sunlight. The camera flash makes them quite different. They actually turned out much better than I expected, and although they're not true mirror images of each other, they do not look out of place. The photo accentuates the surface defects which aren't normally visible.The flat surface behind the lens was covered with aluminium tape to give a reflective surface behind the bulb. Six holes were drilled. Two for mounting the lens, two to bring the wires through, and two to mount the entire assembly to the car. The bulbs are the "inline" type commonly available from any parts store, and the wires are simply soldered to the ends of the bulb, which is kept from vibrating excessively with a dab of clear silicon. The bulbs selected are 7W, and are more than bright enough.The lens' rim was then painted with a silver paint for a more finished look.A thin neoprene foam weather strip was applied around its outside perimeter to keep water out from behind it. The photo above shows a fabricated 1”x 0.100” bracket that uses two 1/4" bolts to draw the turn signal assembly tight against the car body. The two wires are sealed with a dab of silicon where they enter fibreglass. Painting the rear bracket remains on the to-do list!The next photo shows the outer grille frame notched to go around the rubber bumper mount. The frame was marked, and then notched with a pair of tin snips. In this case, the grille's rear supporting frame was discarded, and only the outside "skin" was used. If you wanted something sturdier, the rear framework could be saved. In my case, I had to get at the dents on the cosmetic skin, and didn't feel the need to reassemble it. The frame is very firmly attached, and it has no structural role. The 4 eBay grille frames were badly corroded, and had plenty of dings and dents (whaddya want for $10). I bought them because I thought that it would take a couple of tries to get it right, and didn't want to ruin a nice grille or two or three figuring how to do it. In the end, I used only one, and it was dead simple. The stainless mesh was formed over plywood templates that were cut out to fit the grille frame openings on either side of the logo bar. The forming was done by pinning the mesh between the plywood pieces in a vice, and just working the stainless around with a hammer. After the perimeter bend is complete, the mesh has to be gently persuaded to take on the curve of the frame. It's important not to kink it. BTW, the openings left and right of the logo bar were not the same, differing in length by about 1/8”!! So 2 plywood templates were required. The mesh is held to the frame with screws as seen in the next photo. One of the 5 aluminium brackets that hold the grille assembly to the car is also visible in the lower left hand corner next to the rubber bumper mount. BTW: The first mesh pieces made were painted black. Error! The mesh "disappeared" when installed, and all you could see were the horns, bumper mounts, wires and fans. The glitter of the raw stainless steel masks all that.The next shot shows a detail of the rear bumper mounting. There is a light crash bar mounted via 1x1x1/8 square tube Spacers to the body at three points through existing holes in the bodywork. The spacers are thru-bolted using 5/16” nuts and bolts. I doubt this crash bar adds much protection, and its main function is to support the brackets that hold the chrome skin. The bumper ends are again held to the body work with fabricated 3/4" x 1/10" bar stock bent to shape.The last photo shows one of the fabricated filler pieces that are required below each tail light. Light perforated steel sheet was used, making them easy to form to shape by hand. They were then covered with a fine fiberglass cloth and resin, sanded and painted. They have inward flanges where they attach to the bodywork, and were originally held on by double sided trim adhesive. The tape didn't stand the test of time and they are now held on with a bracket similar to that holding the front turn signal bezels, via a bolt into the trunk. If I had kept strictly to the rules, a better alternative would have been to use one of the automotive super adhesives made by companies like Lord and Loctite. Unfortunately, there is no photo of the bracket. (In this case the brackets are in fact painted!) Obviously, the visible side joint is unorthodox, but I find that it is quite acceptable and would have done the same thing if I had purchased these pieces from one of the conversion kit vendors. The space between the chrome bumper and body is covered by a piece of black plastic held on by the same double sided trim tape that failed to hold onto the filler pieces. Further plans are to make another grille frame, and paint it green. If I like the look, I may go further to paint the bumper green and add a front spoiler. The bumper may have to be stripped of its chrome. Painting it and the spoiler will probably require a proper colour match and therefore there will probably be more expensive than the work done to date. As it is, I like the current look, and will probably put those plans off to the future when time permits. 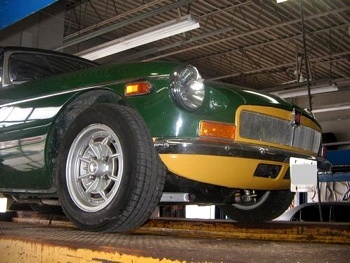 Comments on "Retro Restyle of a 1980 MGB"